As a soccer coach for teenage girls ( late 1980's and early 1990's) I was always looking for some way to motivate the girls during the tedious ball handling drills in the fall. We finally hit on the idea of having a pumpkin giveaway from a limited selection of pumpkins I planted at our farm that ranged in size from very large to very small. Girls that scored best on the drill would get first pick ( and naturally the biggest ); girls who blew off the drill and came in last would end up with a very small pumpkin. This turned out to be a great motivator! suggested that we grow pumpkins for sale. Not wanting to discourage their suggestions I commented that I barely had enough time for the crops that we currently grew, but if they wanted to handle it themselves we could share the profits. Much to my surprise, they took the initiative, planting, weeding in the hot summer sun, then spending many cold weekends in October selling the pumpkins from the back of our farm wagon. The girls ended up making several hundred dollars that year and told me future job interviewers were very much impressed with their industry and determination. The rest, as they say, is history. From 2002 thru 2009, our final year in the pumpkin business, pumpkins was our largest sales item. When I last saw them a few years ago, Kari had graduated from University of Missouri and was doing computer graphic art work for a St. Louis firm, and Monica was doing postgraduate work at Western Michigan University. 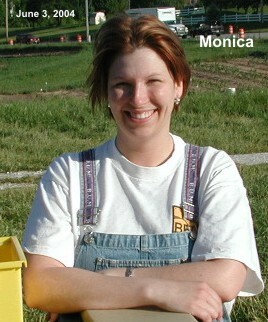 June 2004 update: Monica just completed graduate studies at Western Michigan and will be doing Family Counseling. Monica and her husband live in a very nice area of Michigan -- not far from the beach! 2009 Update: Monica moved back to the St. Louis area and formed her own Family Counseling Business, Sandhill Counseling: http://www.sandhillcounseling.com/default.aspx. 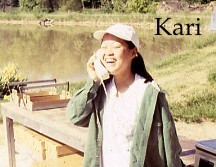 2010 Update: Monica sent me a very nice email reflecting on her 4 years working at Lakeview Farms.